As my 5-year-old becomes school age and I have yet to start an earnest Kindergarten program for him, I have been researching different homeschooling methods to find what is best for my family. This review is simply a reflection of part of that research. I first heard about “A Thomas Jefferson Education” by Oliver DeMille (henceforth “TJed”) when I was in high school. I admit their sales pitch sounds fantastic. “A Leadership Education for the 21st century”. “An education like the founding fathers had”, and an education based on reading great classics and finding good mentors to help in your education. As a teenager, I was thrilled during DeMille’s lectures at the homeschooling conventions I attended, surrounded by other homeschoolers and feeling the momentum in the room. I was inspired to want to become a leader myself. As a youth I had great mentors in my musical studies, and they had a profound influence on my life. I was proud to have an education that wasn’t “on the conveyor belt” of public school, and the basic premises of TJed rang true to me. As a college student I stumbled across “A Thomas Jefferson Education” the book, read it, and felt inspired to read more classics. I have many good friends who do TJed, and I admire them and their children. My own siblings have benefitted from “Liberty Girls” and “Knights of Freedom”, local homeschooling co-ops started by TJed proponents. Overall, I have had a good overall impression of TJed. I preface my review like this because I have always tried to offer my criticisms sandwiched between compliments. That’s what I will be doing with this post, so stay tuned for the appropriate praise of TJed at the end. I found this forum thread, and wondered why there seemed to be such negative comments about the method. I read through a few different blogs, and I especially found "Why I don't do TJed" to be the best researched, referenced, and articulated argument against it. I read the entire blog as well as most of the comments, and this author makes sense to me. I won’t reiterate everything that he says in this post, but I will say that I agree with him in the entirety. I found myself connecting the dots from a few encounters I have had with TJed proponents that struck me as odd. For example, my early-learning approach with Doman’s methods have received some harsh criticisms, with the argument given that I should wait until they are eight to deliberately teach my children to read. Why would a method that encourages the kind of scholarship Jefferson had object to early education? I have a bit of a chip on my shoulder from that incident, so I’m glad I don’t remember who the discussion was with. I only know that Oliver DeMille was quoted as a reference, in the effort to prove that my approach was incorrect. This didn’t change my positive outlook of TJed at the time, but when I read the blog’s post "The Learning Phases are from Modern Child Development Theory", it just made sense to me. I have since re-read the main TJed book, as well as “A Thomas Jefferson Education Home Companion”, and “Leadership Education: The Phases of Learning”. I have also done a deeper study of Dewey, Vygotsky, Erikson and Piaget, whom DeMille does indeed call “the four gospels of modern education.” I admit that I found my study of Piaget to be particularly interesting. I read most of “Understanding Piaget” by Mary Ann Pulaski, available at the Logan library if any of my local friends want to check it out. It was interesting. After looking at the phases from all of these perspectives, I have to agree with the critical blog. I think he was spot on. Whether you agree with DeMille’s phases of learning or not is a mute point. He may be right. The phases might work for your family, and that’s great. We could debate that issue. But I think it’s a bait and switch to say that these phases of learning were what every great leader of the past had, because it’s simply not true. These phases were drawn from modern theory. Demille references these authors himself. While they may reflect the education of a few of our great leaders, they certainly weren’t applied to all of the great leaders, least of all the method’s namesake, Thomas Jefferson. 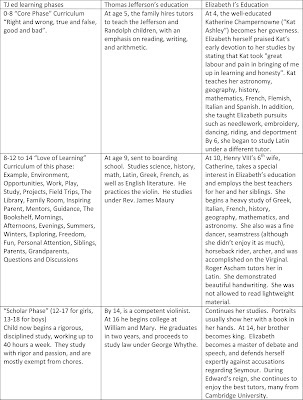 As a side study, I compared Jefferson’s actual education to DeMille’s phases, and, because I am currently interested in Queen Elizabeth I, I did a comparison of her life during each “phase” as well. If anyone was given a “leadership education”, ie, educated to be a leader, it was she. If anyone loved learning, had wonderful learning opportunities and great mentors, and grew to be a well-educated, great leader, it was she. Naturally I cannot provide such an amazing education for my children, but I can also benefit by modeling her education for my children as much as possible, so I reference her childhood for that reason. If all great leaders of the past learned through these phases, Elizabeth I is as good of an example as any, and represents the female perspective well. The early core phase is the example I find most disturbing. 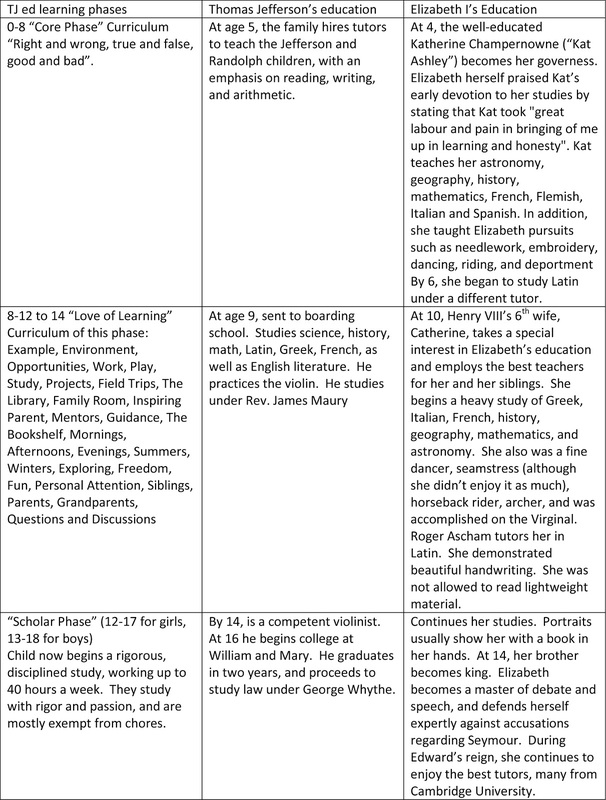 While the “scholar phase” may resemble Jefferson’s and Elizabeth’s youth with the time intensity of their study, a child who has not mastered the three ‘R’’s, who has not had a solid foundation in them, will not be as prepared as Jefferson and Elizabeth to benefit from the 12-18 year-old stage of intense study. I don’t think the scholar phase is an event that we should wait for. This leads me to my second criticism of TJed for this post, which is “Inspire, not Require”. I disagree. My goal is to “Inspire that which I Require”. Let me explain. I don’t believe that reading a classic book in front of my youth will inspire them to read a classic book too, any more then I think wearing clothing in front of my 5-year-old will inspire him to get dressed in the morning. He may get cold, see my clothes, and decide that he should get dressed too (hurray for winters! ), but it is more likely that he will get dressed because it is what I require of him. Certainly I should set the example. If I went around half dressed, it would be hypocritical of me to demand that he get dressed when I am unwilling myself. How do I inspire him to get dressed? I might ask him if he’s cold. I can tell him the story of Adam and Eve. I can teach him the importance of modesty. I can appeal to the comfort of clothing over rough material like carpet. I may provide him with a variety of awesome clothing with “Lightning McQueen” or “Star Wars” characters on them, clothes so cool he will certainly want to get dressed. All of these methods of inspiring my children might work, and indeed they often do. But when push comes to shove, I REQUIRE that he get dressed in the morning. He is not going to the store in nothing but his underwear. And in the hubbub of the Sunday morning rush to church, I have on occasion resorted to pinning him down while I button up his Sunday shirt and tie his shoes. If then, I may require my 5-year-old to wear clothing, to be polite, to brush his teeth, and to help out around the home, why is it so unreasonable that I should require him to practice his penmanship? I was required to brush my teeth as a kid despite my rebellious wishes, and as an adult, I still brush my teeth. I didn’t want to do my English lessons in those A Beka books as a young child, but my mother made me do them anyway, and I’m a better person for it. I was well prepared for college, and I doubt my writing skills would have been sufficient without my mother’s loving guidance. I wasn’t inspired enough to pursue the basic mastery I do have on my own. My mother required, and I rose to her expectations. I reflected on this principle when I read the conference talk “Becoming Goodly Parents” by Elder Tom Perry a few weeks ago. The following relates to our study of the gospel. 1. In a general sense, any commandment or order intended as an authoritative rule of action; but applied particularly to commands respecting moral conduct. The ten commandments are so many precepts for the regulation of our moral conduct. 2. In law, a command or mandate in writing. The final point I will address in this blog is my concern about the “You, not Them” principle of teaching. I agree that I should set an example to my children. I read and they see it. I play the piano and they see it. My husband and I don’t talk down to our children, we expose them to as high of a vocabulary as we are able. I should never neglect my own personal development. However, I will never do this at the expense of “them”. It’s ALL about them. I don’t want to become the best person I can be so that they will have more to aspire to. I want them to surpass me, preferably big time. It’s all about creating an environment appropriate for their learning. If it was all about me, I would be reading more of Jane Austin’s novels, systematically making a list of new vocabulary words. I would have a blog focusing my reviews of classic literature, instead of on how to be a professional mother. But because it's about them, my area of focus is on reading books like “A Well Trained Mind”, online reviews of homeschool curriculums, and education forums like “BrillKids”. The books we bring home from the library are mostly to enhance my children’s education, not mine. Guess what? I’m learning a lot too. To teach my children about the world, I must be one chapter ahead. At least that’s the goal. I’m quickly realizing that ultimately my role will soon enough be to open as many doors as possible for my children. I must have the perception to help them continue to progress one chapter ahead. This takes a lot of time, effort, and work. If it was about me, not them, I doubt I would be able to fill my role in this regard. “Will they live happily ever after? The way they should be living? What the Lord wants them to be? This seems like a good time to switch gears and offer praise where praise is due to the TJed movement. There is a strong emphasis on moral character, and I honor them for that. I love the idea of “Youth”, not “Teenager”. The word “teenager” is relatively new, and is associated, in many ways with the rebellious follies of the high-school drama queen, the high school jock, or the ditsy cheerleader obsessed with makeup and the upcoming date on Friday night. (I’m not implying that all cheerleaders are ditsy, rather than trying to portray the quintessential image that a cheerleader who is ditsy brings to mind.) A teenager is in a phase of development that is isolated from the rest of their life. Youth, on the other hand, are young adults. We don’t want to raise our children to be kids, we want them to grow up. A family with youth recognizes that this transition is coming, and prepares for it. In my church, we have “Young men” and “Young Women”, ages 12-17 inclusive. Now at 18, a young man may serve a full-time, honorable mission. This is the potential the church sees in him, while the world still gives him the “lofty” aspiration of continuing his “teenager” years. I want my children to become “youth”. I will also say that I gained a lot of good advice from “A Thomas Jefferson Home Companion”. I do recommend this book. One of the valuable insights I got from this book is the importance of having an educational master plan. They say if you fail to plan, you plan to fail. I agree! I’m trying to get a good plan in place so I can follow that blueprint, and it’s changed a lot over the last couple of months. The Home Companion has a beautiful chapter about how a free society should develop the traits of Liber and Public Virtue. Demille then goes on to define “Liber”. It comes from the Latin root for true, or tree bark, which was used for contracts and writing. Liber was associated with the elete who could read and write. There were two classes of people in ancient Rome, the slaves, and the liber. Liber is the root of Liberty, Library, and liberal arts. I add that God gives liberally to those who seek wisdom from him. He then goes on to describe Public Virtue, which is not the state of having a public with individual virtue, or electing officials with personal virtue, as much as it is having a society that is willing to voluntarily sacrifice personal benefit for the good of society. DeMille shares the inspiring stories of Robert and Mary Morris, Thomas and Lucy Nelson, and Samuel and Eliza Adams, among others. It was a beautiful chapter that touched me. DeMille points out that it is a fallacy to think that finding “balance” in our lives means that we should balance work with entertainment. The correct balance for our lives would be 8 hours of sleep, 8 hours of work, and 8 hours of leisure time. Leisure ≠ Entertainment. As a matter of fact, entertainment was something that the elite of ancient Rome created for the slaves to keep them pacified. This idea had a great influence on me. Now when I find myself wanting to waste time on Facebook, a little voice says “Entertainment is for slaves.” Hopefully I’m improving, and am filling my leisure time with more worthy pursuits. The Home Companion has some fantastic appendixes, such as suggestions for how to teach homemaking skills, and suggestions for book discussions with older children. So there you have it in a nutshell, my review of TJed. This study has been a long process, and I’ve delayed the process of typing out my feelings and sharing them publically, as I know some of my local homeschooling friends may see it and it is not my intention to offend. I think I have looked at the method as a whole objectively, and fairly. I read criticisms, but turned to the primary sources (Demille) before drawing my own conclusions. I feel like I should share those conclusions, and this blog post is it. I doubt that there is a perfect homeschooling method that would work for every family, so, as always, the best thing to do is to take what we want and leave the rest. This is what I have done with TJed. I’m “leaving” most of it, but I do think my study of DeMille’s books were worthwhile. This is especially true as I now have a better understanding of how TJed works, and my local homeschooling community is overall prone to it. If this approach is working for your family, more power to you. Very articulate post. You are kind in your criticisms and fair in your praise. I find more in TJEd to be positive than you do (and perhaps that is due to semantics and my personal interpretations). I disagree that our local homeschooling community is "overall prone to it." TJEd is a minority within homeschooling communities. Perhaps not, you are probably right. It has always been my perception that a large percentage of our yahoo group were TJed homeschoolers, but lately I've seen a lot of non-TJeders (is that a word?) come out of the woodworks. Luckily our group is fairly supportive of other families and what how they choose to homeschool. I'm also grateful for the feedback. Phew! A local TJed person wasn't offended by this post. It's a sensitive subject and I appreciate that you took the time to step in my shoes long enough to read my post. Thank you! I agree with you whole heartedly. I have been concerned about the TJed approach for some time. You tackled a sensitive subject beautifully, well done. Thank you !!! This is the answer I needed today. I'm just beginning homeschool and love a lot of what I've read about TJed but can't quite get myself,to not require. You said this all so well. And the song making of a Queen ! Truly inspiring! TJEd is working really well for us. I tried a few different methods, but this one was the golden ticket. I was skeptical at first, but I kept coming back to it. When I finally jumped in wholeheartedly, my children soared! I'm not saying it's perfect for every family, but definitely something that needs to be tested and tried first hand instead of just investigated. By their fruits ye shall know them...and I've personally witnessed so many good fruits! I just started my homeschool journey, infact my son is still in kindergarten while I figure out exactly what to do. TJed was the first thing I was introduced to as a potential homeschooler. I like the concept of reading and discussing good books which is what we naturally do anyway. Before I started reading any negative aspects of TJed I felt weird about some of the things so your article and the links you referred to make sense. I guess I'm wondering what an alternative is? Alot of the articles I've been reading don't recommend or mention what method or whatever they use instead. Where does one start that wants to homeschool with curriculum or the like? Thanks so much! Thanks for posting. A few homeschoolers I work with push this method. It's refreshing to read criticism on the topic with critical thinking. Good links too. Thanks for sharing.